So, tell me if this has ever happened to you. It’s 10 or 11 in the morning and you wander down the stairs into the kitchen. Deep down you know what to expect but, somehow, you hope, it won’t be true. It is. The kitchen is a mess. Empty glasses and bottles everywhere. There are bowls of soggy chips, stale popcorn and a big plate of once-expensive cheese that’s gone hard. Green stuff that you hope was once spinach dip has dried like concrete on the harvest table you always tell the kids to be careful not to damage. By necessity, because of the state of the room and the state of your head, you move slowly, intent only on finding the last of the Tylenol and heading back to bed until tomorrow or, if you’re really lucky, the next day. Standing tall and proud among all the empties is your one, precious bottle of wine. It’s the bottle you vowed not to open until your daughter’s wedding or your boss’s funeral, whichever comes first. It’s the bottle that cost more than your first car. It has been uncorked. Steady now, this gets worse. You reach out to keep from falling and find the spinach dip a helpful grip (it will need to be chipped off before the kids see it, you realize) as a wave of nausea rolls over you. You stare, transfixed at the year on the label; a year you will never get back. Right about now you will hear a noise. A series of noises, in fact. You strain to focus and realize that it is snoring and it’s coming from the livingroom and the family room and perhaps even the front hall. You curse the lack of cabs at 2 (3?4?5?)am. Looking back at the bottle, the nausea subsides temporarily and anger takes its place. Now, take a deep breath. These are still your friends and hurting them will not make things better. Look away from the knife block and find the Tylenol. Besides, you don’t yet remember whether it was them or you who opened that bottle. Concentrate on the Tylenol. By the time you get up, your friends will have slipped out to suffer further at home. Well, all your friends but one – the one who thinks an invitation to a party one night means he’s welcome to stay for dinner the next night. He will be in front of your television drinking a beer. He will ask why you don’t subscribe to The Movie Network. Just ignore him. He’s used to it and you have work to do. Next, find some sage. Sage, the herb, not sage, the advice (you are all out of sage advice because, if you had any, your head wouldn’t be thumping like this). Some red wine vinegar, a little sugar and a little liquid pectin and you’re ready to go. 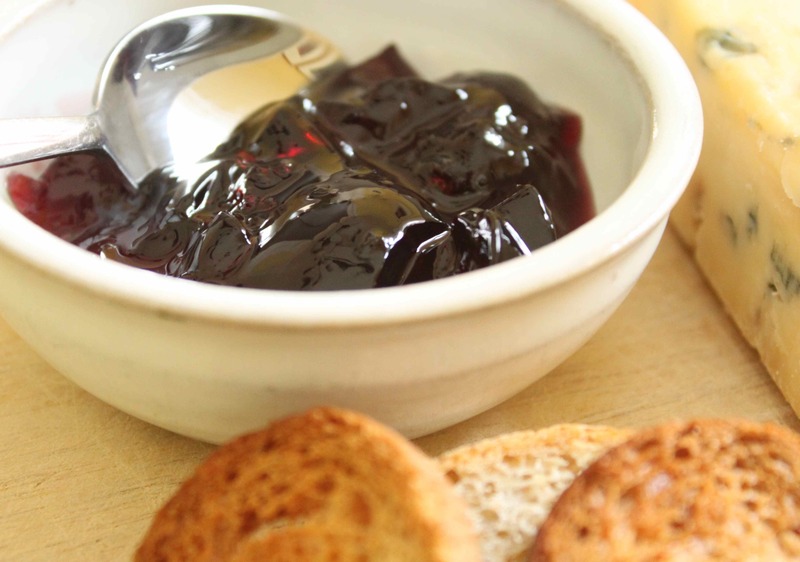 You’re going to make red wine jelly. I know, I know. You don’t want to go anywhere near red wine right now but, trust me, saving that precious bottle is worth it. And this savoury jelly really is good with cheese or as a glaze for red meat. So, buck up old bean and do your duty. Besides, next time your friends come over (and there will be a next time), you can serve it with more expensive cheese and remark how it is exactly the same colour as the stain on your thousand-dollar Persian rug. See if that jogs their memory. Bring wine, vinegar and sage to a boil in a large stainless steel saucepan. Remove from heat and let stand for 30 minutes so sage can infuse liquid. Strain through a sieve (discard solids), return to saucepan and add sugar, stirring to dissolve. Bring to a boil and boil, stirring constantly for 1 minute over high heat. Remove and add pectin, stirring to mix well. Place lids (but not screw bands) in very hot (not boiling) water for a few minutes to soften seal. Ladle jelly mixture into 1 cup (250 ml) jars., leaving 1/4 inch headspace. Wipe rim. Center lid on jar. Screw band down until resistance is met, then increase to fingertip-tight. Place jars in canner, ensuring they are completely covered with water. Bring to a boil and process for 10 minutes. Remove jars, cool on the counter for 24 hours, check seal (keep any that haven’t sealed in the fridge and enjoy them over the next couple of months) and store in a cool dark place for up to one year. This entry was posted in Preserves and tagged canning, cheese, glaze, jelly, preserving, red wine, sage. Bookmark the permalink.